In "The Book of Henry," single mom Naomi Watts has surrendered control of her family to 11-year-old Jaeden Lieberher; but that's OK, because the kid's a genius, who trades stocks on the side and is truly the grownup in the room. The first third of the story creates a mostly fun universe, as the plot turns into a puzzle. Jaeden's younger brother is played by Jacob Tremblay, the kid who was so good in "Room." Sarah Silverman plays one of Naomi's best friends, a fellow waitress at the diner where Naomi really doesn't need to work. The family goes along, until a plot twist changes everything. Dark tones surround the harsh man next door, played by Dean Norris of "Breaking Bad," who may or may not be abusing his stepdaughter. The book referred to in the title, is a set of instructions from Henry. It leads into a finale full of tension and unsettling turns, concluding with a sigh of relief. Don't bother overthinking this story. It's more enjoyable, if you just go with it. 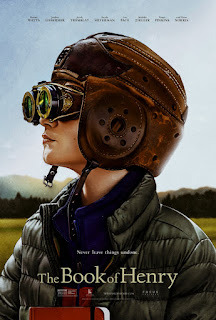 "The Book of Henry" is rated PG-13 and earns 3 stars. Does it deliver what it promises? Unusual family story. Is it entertaining? Great twists & turns and unexpected events. Is it worth the price of admission? Worth it.